Try the Badlands Inn for a full-service hotel experience from May to mid-September. Located just one mile from Badlands National Park, this cozy 20 room inn features local gifts and art, an unobstructed view of the badlands, and pet-friendly non-smoking rooms. Eventually, because of erosion, the badlands will disappear completely and the world will reclaim them and new structures will form in their place. For now, they are sharply contrasted within the park by the largest undisturbed prairies in the United States. Once home to many Native American tribes, these people were driven out by homesteaders in the 1800’s. Remnants of native dwelling sites exist along with many other historic artifacts. This area is home to some of the most productive fossil hunting in the world, and more than 40 species are here for the finding. The park can be seen by driving the highway 240 loop, hiking any of its abundant trails, or by taking a guided tour. One of the most interesting tours offered is the stargazing program highlighted by a yearly astronomy festival. 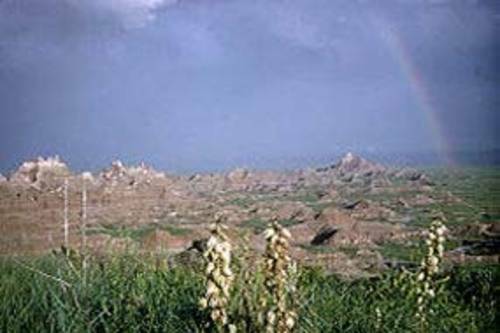 Set amidst the prairie at the base of South Dakota's Badland pinnacles, your stay at the Cedar Pass Lodge will be a pleasant one filled with the beautiful vistas that contribute to the wonderful setting that is Badlands National Park. Each cabin is furnished with heat/air conditioning, a coffee pot, and a bathroom. Cedar Pass Lodge is a must stop when en-route through South Dakota's Badlands. Badlands Inn is in close proximity of the Badlands National Park. 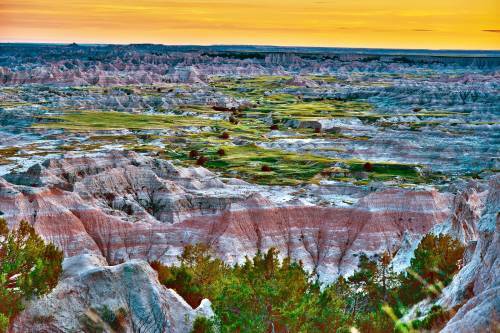 Beautiful views of the Badlands can be seen from each of the twenty rooms offered at Badlands Inn.